Posted on 21st February 2011 by yasmin. When it comes to hosting a dinner party, you of course expect to portray to your guests nothing short of perfection. Whether you are planning a relaxed affair or a black tie bonanza; from the food you prepare and serve, to the place settings, to the lighting; perfection is what you should strive for. Food - So here is the scenario; you have 8 dinner guests coming over at approximately 7pm, you already have the smoked salmon and champagne chilling in the fridge, your roast beef is slowly cooking in the oven and your apple crumble is ready and waiting to be baked. Now for the finishing touches! Tableware - For the table settings, we love the unique designs of historic Italian Porcelain designers Richard Ginori 1735. Their new range of tableware named ‘Metroquadro’ is simply stunning as well as uniquely funky and individual. Each individual item is dedicated to a different food or wine producer, and are inspired by traditional Italian souvenir plates. Lighting - Lighting is the key to any dinner party as it sets the mood of the evening. Avoid strong strobe or spot styled lighting fixtures and instead opt for soft lighting and candles. This will ensure that your guests are as relaxed as possible. 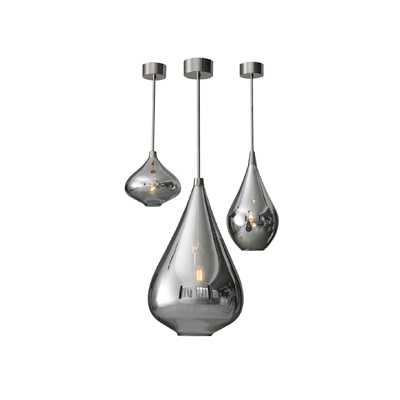 Known as ‘Hurricane Drops’ these classic glass drop pendant lights by Skogsberg & Smart will add a serene atmosphere to any dinner party. These ‘Hurricane Drops’ which work as a trio, hand from a nickel plated pole and look simply stunning. As well as having the perfect lighting, it is also important that you make your dinner party seem personal and welcoming. Controliss electric roller blinds are not only the ultimate party piece. Our remote controlled blinds offer one-touch child safe operation so you can adapt the mood of your dinner party without leaving the banquet to fiddle with cord controls. Posted on 15th November 2010 by jenny. 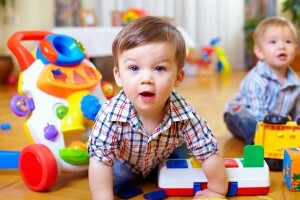 When we think about childrens rooms, we often think about bedrooms and playrooms. However, if you have school-aged children, it would be a great idea to design a practical work space for them to do their home work and other creative endeavours. What better way to inspire them to do their best work than designing a home work space dedicated entirely for their creative and school-related pursuits. Whether they are five years old starting junior school or 18 and ready for university, here's how to make the best home work space that will motivate your children to study hard. Work with Them The first rule is to consult your children about creating a home work space for them. Working with your children to create the ideal work space for them will motivate them to use the space and claim ownership of the work space when the time comes. Together, examine the place where they are used to doing their homework. What characteristics of the present space do they love? Which elements don’t they like? Perhaps they like to spread their stuff on a kitchen table. Maybe they like having you close by so they consult you with their homework. Make a list of what they want in a workspace and then make sure that these traits are included in their workspace. Location, location, location Now that you have a good idea of your childs likes and dislikes, it’s time to find the perfect location for this workspace. For younger kids who’ll need you close by, you may need to carve out a space near the kitchen or dining room so you can supervise their homework. Older children may be more independent and need some place quiet and away from other family members to concentrate such as their bedroom. Let them choose the space so they will be more encouraged to use the area. Child-Friendly Furniture After you have decided with the location, include essential furniture such as a comfortable desk chair that is ergonomically friendly. Include storage areas to keep the space neat and clean. You could customise file cabinets and make it more child-friendly by adding fun stencils or stickers. If space is an issue, there are many inventive ways that you can transform furniture into storage, such as using a workbench with cubby holes. The workbench can even accommodate a friend while they are working on school projects. Comfort is Key With the furniture and storage in place, you can make the place comfortable. If your children are allowed to work with a laptop or a computer, ensure that the problem of glare is addressed. Don’t risk eyestrain for your children and purchase glare-preventing child safe window blinds, such as the Controliss blackout Roller blinds in Oscuro Petal Bloom or Oscuro Sapphire. If you want a neutral shade, blackout Roller blinds in Oscuro Cream will work well in any room. A desk light is also important to complement the ambient light in the workspace location. After you have fitted your childs home work haven, allow them to accessorise their space with their very own artworks and knickknacks. Personalising their own space will help them enjoy the area more. An attractive place filled with light and colour will surely inspire your children to excel in their studies and actually look forward to doing their home work. Posted on 8th November 2010 by jenny. Striped prints have never been out of style. Just look around you and you'll see this classic pattern in chic clothes from the catwalk to shop windows and with interior decorating sometimes taking its cue from the fashion world, it will never be a mistake to use this quintessential element in your home. The reliability of stripes in interior design is indisputable. Stripes in walls can be used to enhance the dimensions of your room. Smaller rooms can look bigger if you have a horizontal stripe that runs through your wall. Ensure that you use light and cool tones to create an expansive feeling in your space. Stripes in walls also give a contemporary vibe and give your room an instant update. However, don't go overboard with stripes as putting this pattern into everything will create a distracting busyness that could spell an "interior decorating mistake." 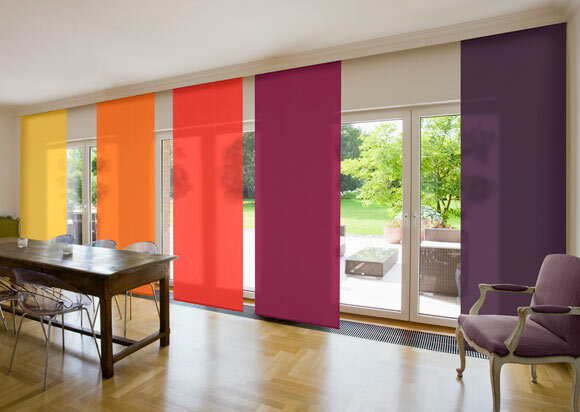 Instead, go for feature walls in striped wallpaper or roller blinds in a nice striped pattern. 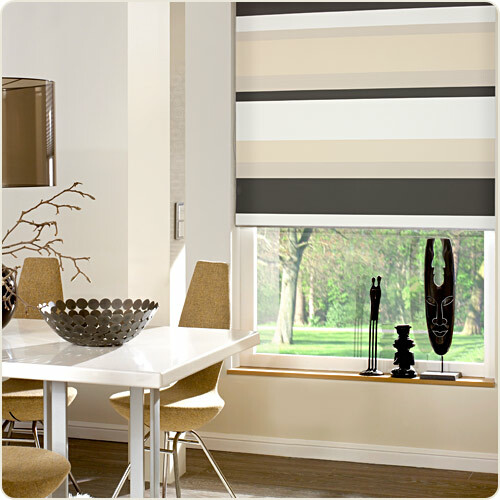 The Bloque Natural blackout Roller blinds will go well in any room because of its neutral shades. On the other hand, Bloque Plum gives you flexibility. Its pink shade gives a trendy look without looking too feminine because the striped pattern offsets this otherwise feminine colour. You can also apply stripes through carpeting that can extend your floor space. Dispel the dullness of your staircase with a vertical stripe that will draw the eye upwards or downwards depending on where you are. If you don’t feel like going all-out with your walls, you can use stripes in your accent furniture pieces. Drawers decorated in stripes are fun, while a striped accent chair could be a great conversation piece. However, you don’t have to paint or reupholster your furniture to achieve this. A stripy fabric runner or a striped throw can do the trick without too much expense or effort. You can also buy a few inexpensive cushions in this reliable pattern or spread a tablecloth in vibrant stripes. Like a vivid rainbow decorating the blue sky, stripes can give a playful edge to your decorating and bring about a positive atmosphere that you truly need in the gloom of November. Posted on 6th November 2010 by jenny. Sharing a home with someone you truly love is one of the best moments in your life and what better way to show your sweetheart with a beautifully decorated bedroom that signifies your smouldering love for each other. We're not talking about something as passé as sprinkling your bed with rose petals. Read on to find out how to create a romantic bedroom that is fit for your intimate and passionate moments. An accent wall that evokes romance can be created by covering your walls with subtle shades and patterns. 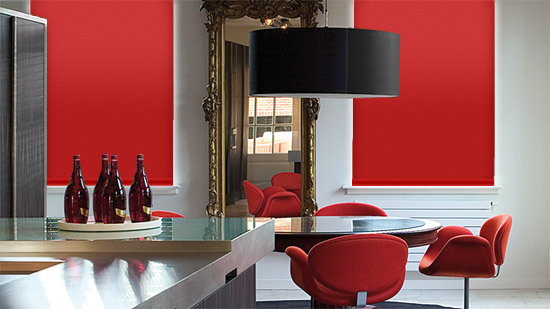 This can then be paired with blackout Roller blinds in a provocative shade of red. 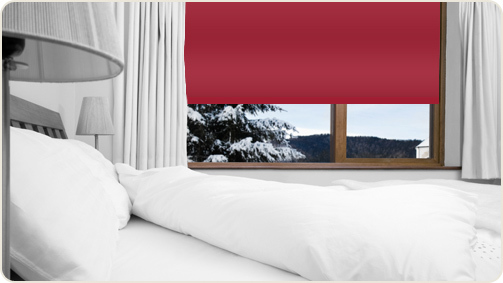 Our line of blackout Roller blinds are available in a variety colours that ensure your bedroom total privacy. If you'd like the accent walls to be covered in a rich shade, soften the dramatic colour with neutral blackout roller shades, such as our Oscuro Cream or Estrella Ice which spells the ultimate in luxury with their smooth silk finish. Neutral colours in your furniture will allow you to play with bolder colours in your bedroom. Romance in furniture can be seen in intricate details and sensual curves. To create a feeling of indulgence, you can opt for a headboard that is upholstered in gorgeous velvet. After you've chosen your bed, match it with a bedside table which could hold a photo frame of you and your loved one for a constant reminder of your joyful moments. 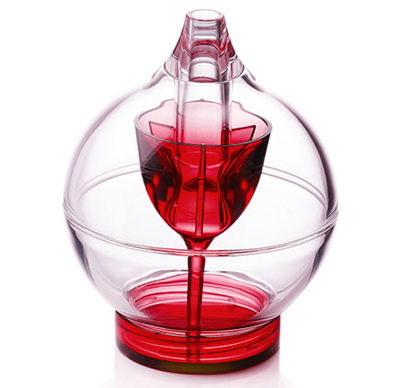 Fill your room with reminders of your love with choice accessories that evoke wonderful memories. Display your mementoes in creative ways. 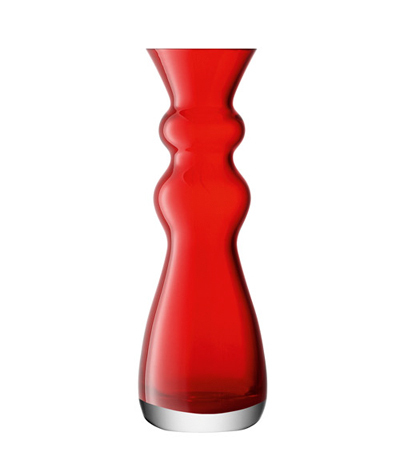 We suggest looking for ways to include red, the colour of passion and desire, in your accessories. Better yet, use this colour in your window blinds, such as our roller blinds in Liso Devil Red which projects a seductive yet subtle message of love. Transform your bedroom into a warm and cosy room perfect for cuddling and intimacy or ignite passion with low key lighting. You can install dimmers in your room so that you can adjust the level of illumination. This can also be done when you choose Controliss electric blinds through a remote control. Our blackout shades completely blocks out the sunlight, giving your room the feel of a perfect evening even when during the daytime. A romantic bedroom is the best way to show your love, so rely on your instincts and create a personalised design for one of the most private rooms in your home. Posted on 29th October 2010 by jenny. Everyone dreams of having a home that has airy spaces and high ceilings. If the dimensions of your current abode doesn't quite live up to those standards in terms of space, do not despair. Here are a few ways for you to make the most of your space without having to move to a pricier house or getting a wallet-draining mortgage. Small spaces with large windows are a great way to open up your space. Large windows let in abundant light which makes a small space feel airy and light. Make use of vertical blinds in your windows, preferably in sheers such as our Vertical Blinds in Haze White or Verso Dairy. The light-inviting Vero fabrics are also available in the Controliss selection of Motorised Roller blinds. You can also paint your walls a light shade to reflect as much light as possible inside your space, giving an impression of spaciousness. If you'd like a touch of colour in a room, then introduce one rich colour in an accent wall and paint the other walls in a neutral shade. Before you buy any furniture, think carefully about your lifestyle and only limit your furniture to the essentials. After you have pinpointed your furniture needs, look for compact yet stylish designs for your furniture that you can fully use. For example, in your dining room, instead of looking for individual chairs you can probably use a bench that will seat more guests without taking up more space. Choose pieces that will do double-duty, such as a coffee table with extra storage underneath. Try to find a way to unify the upholstery with the wall colours so that visual flow is not interrupted. Aim to go for colours that will reflect more light with warmer shades. Speaking of light, avoid a single light source as this tends to draw the walls in making your space appear smaller. Instead, distribute light sources and place them near the walls to make the most of light reflections. Place mirrors in strategic places to give an illusion of more space. Decorating for a small space may require some creative planning, but with these few tips, you can be contented in your home without actually increasing the floor space. Posted on 21st October 2010 by jenny. At a time when simplicity and minimalism are the dominant trends, adding Baroque style accent pieces may add an element of surprise in a space filled with clean lines. Originating from decadent Italy where ornate beauty is embraced and even worshiped, the Baroque style didn't catch on in England until the late 17th and early 18th centuries. 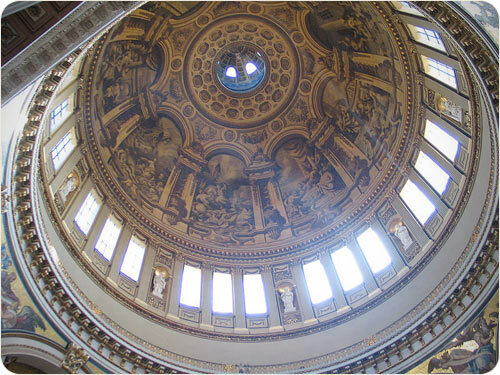 English Baroque architecture can be seen in three famous architectural masterpieces: Christopher Wren's St. Paul's Cathedral and John Vanburgh and Nicholas Hawksmoor's Blenheim Palace and Castle Howard. Baroque evokes feelings of magnificence and boldness which can be seen in the huge domes, spectacular pinnacles, and elegant columns in architecture. The extravagant exterior of the Blenheim Palace in Oxfordshire takes one’s breath away even when viewed from afar. The same feeling of mass and volume can be seen in the immense dome of Castle Howard that bathes its interior with soft natural light. While these ornate details might look overwhelming, you can certainly include the Baroque style into your home through well-chosen accessories. Always remember that to pull the Baroque style in a contemporary home, only introduce accent pieces that will create a strong focal point. To do this, we strongly suggest Baroque-inspired accessories such as the Reina Berry Roller blinds. The elaborate print in a rich shade of purple reminds you of the damask wallpapers and rich tapestries of Edwardian times. If you’re partial to a monochromatic scheme, our Reina Beluga Roller blinds will bring a touch of elegance to these contrasting shades. Not only will these lush fabrics bring the spirit of "more is more" that so characterises the Baroque style, they also give you an air of opulence with their one-touch remote control feature. With our Controliss remote-controlled roller shades, you can embrace the spirit of decadence of this era without sacrificing on space or utility.